It's 08:59 in Oelsnitz (Vogtland), Germany right now. View from the Town Hall A view from the town hall onto Oelsnitz's market. 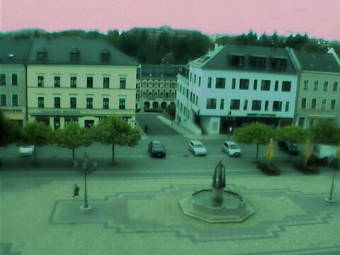 Adorf/Vogtland: Market Square, 7.6 miles away. Schöneck/Vogtland: Landscape View, 7.6 miles away. Auerbach (Vogtland): Neubaugebiet Auerbach, 12.1 miles away. Auerbach (Vogtland): Auerbach-Rempesgrün, 12.1 miles away. Hof (Bavaria): View of the Q-Bogen, 13 miles away. Klingenthal: Berggasthaus Klingenthal, 13.8 miles away. Aschberg: View from the Aschberg, 14.6 miles away. Morgenröthe-Rautenkranz: View of Morgenröthe-Rautenkranz, 14.6 miles away.